Owing to the vast experience in this field, we have emerged as one of the leading manufacturers and exporters of high quality Plastic Scrap Grinder. This product is widely used to break up plastic materials in some pieces (in mm format). This product can be customized as per the requirements and demands of our valuable customers. This product is known for its high production capacity per hour and high load processing capacity. Production Capacity Per Hour 45 Kg. 70 Kg. 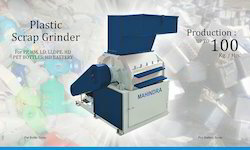 Looking for Polyethylene Scrap Grinder ?